New for the 2019 season! Knock out your next homer with this Rawlings baseball bat. 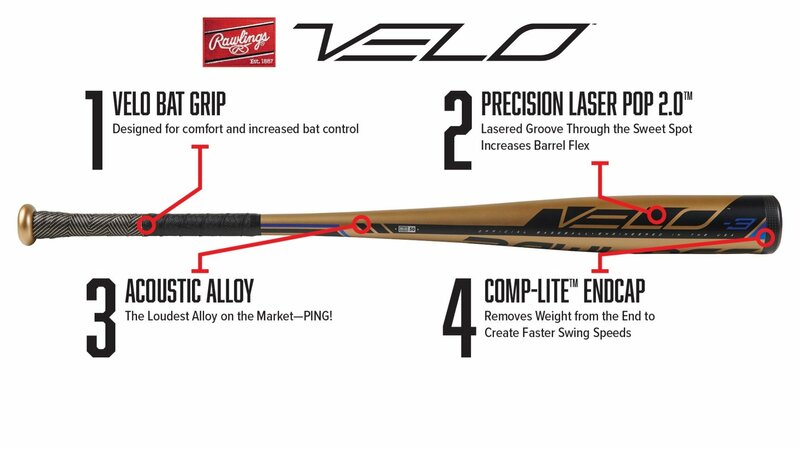 This 2019 Rawlings VELO BBCOR baseball bat has been called the most balanced option in the business, and it has the BBCOR stamp to certify its approval for high school and collegiate style of play. Enjoy the loudest ping in the game when you make contact with this one-piece hybrid baseball bat made of acoustic alloy. A Comp-Lite end cap reduces weight at the end of the bat and helps young players work toward lightening-fast swing speeds. With the Precision pOp 2.0 technology, that helps increase barrel flexibility for superior pop. Build confidence with the enhanced balance of the Rawlings Velo every time you go to bat - the proof is in the ping! This Rawlings VELO BBCOR Baseball Bat (BB9V3) features a drop 3 length to weight ratio, a standard 2 5/8-inch barrel diameter. Reduce distracting vibrations when you make contact with this 2019 Rawlings VELO thanks to a tackified synthetic grip, batters maintain control at the most critical moment of their game. Tru-View Technology reveals the sleek beauty of this bat's 100 percent aluminum alloy composition for complete satisfaction on every hit.